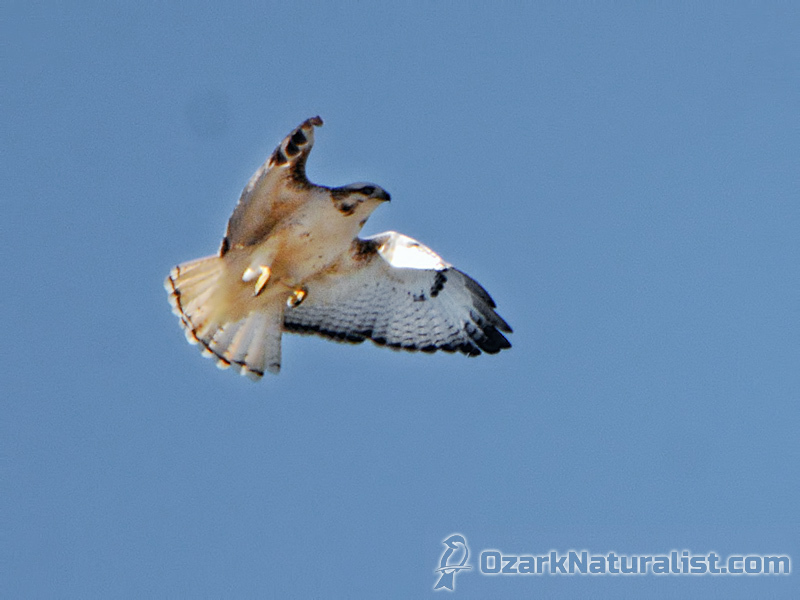 Dayna and I were passing Willow Springs on our way to Springfield, when I spotted a Red-tailed Hawk on the roadside. This happens a lot when we’re traveling and most of the time we continue without stopping. However, if a bird is close to the road, in a good spot to try for a photo or is an unusual color phase, we’ll turn back and “work” it. This bird was in a tree, high above the road on an embankment. Facing east into the morning sun, her breast shone like a beacon. As we passed, I could see that her underside appeared unmarked and I was sure I saw a white head. Hoping she was a Krider’s, a pale morph of the eastern subspecies of Red-tail, I had Dayna take the Hwy 76 exit and go back. Dayna pulled the car to the shoulder, distant enough that I didn’t think she would skedaddle. I usually try to get a few shots from a “safe” distance, then work my way closer if the bird will permit it. This way I at least have an image or two to document the bird. She was wary though, even by Red-tail standards, and bailed as we came to a stop. She zipped across the road (divided, 4-lanes) and landed in a tree. I managed a few shots as she passed, all blurry and out of focus. Still, they were good enough to confirm that her head was white and that her tail appeared to be white or maybe pink. This was looking good if I could find a way to get a decent shot. A second bird joined her, this one more typically colored and noticeably smaller. 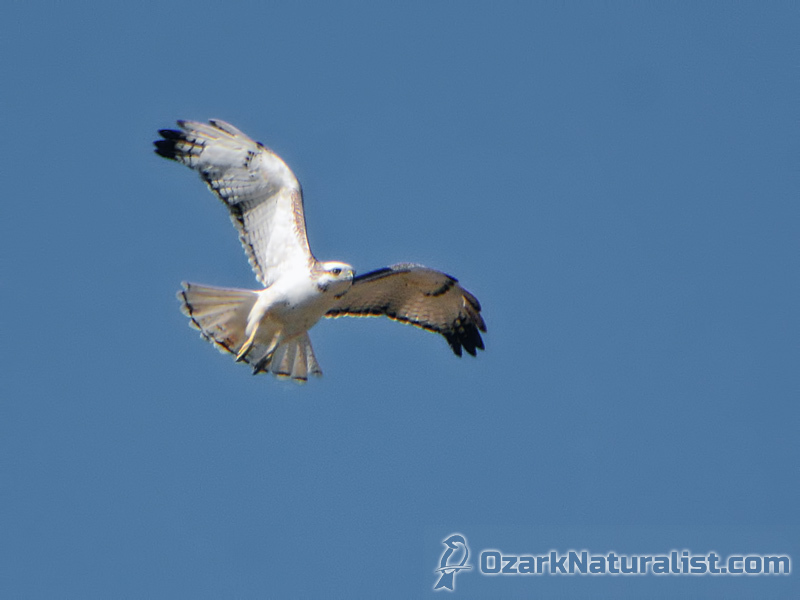 This is why I’ve been calling the first bird “she,” since female Red-tails are larger than males. They played a short game of chase, then against all odds, the first bird flew back to our side of the road and began circling. As she soared round, slowly gaining altitude, I shot over a hundred photos. To say that I’m very disappointed in the photo quality would be an understatement. I had excellent light and was shooting at a high shutter speed (1/2500th of a second.) This combination usually produces good results. But the bird wasn’t quite close enough and someone— who shall remain nameless to protect the stupid—forgot to turn off the lens’ Vibration Control. This feature is fabulous if you’re trying to hand-hold your camera and photograph non-moving objects. But if you’re trying to track a flying bird, it tries to compensate for your movement as you so. This is not a good thing. Therefore, we have crappy photos to look at. But they’re good enough to serve my purposes here. Field marks and plumage coloring are all visible and that’s the important thing. Those are all close matches, so I believe she was a Krider’s Hawk. The thing that confuses me though, is that she and the second hawk seemed to be together, a mated paired. This, in itself, isn’t odd. 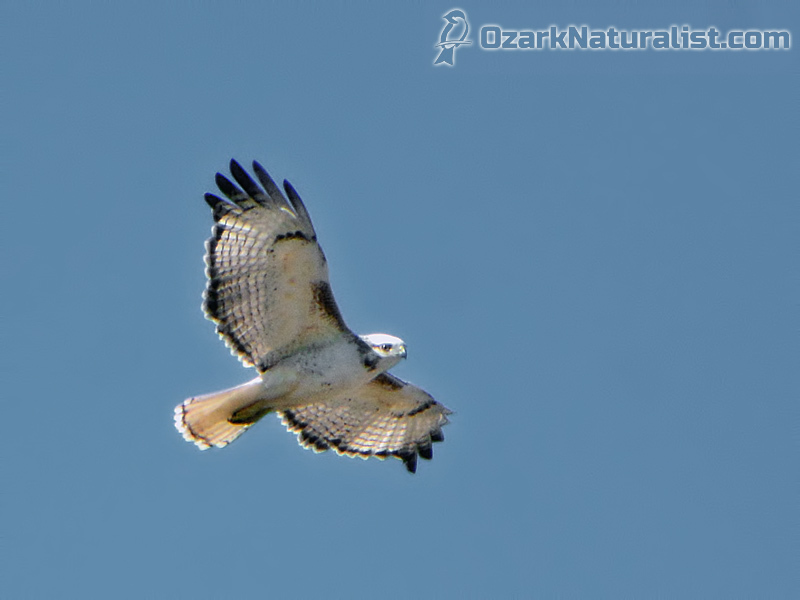 It’s March and Red-tails should be paired and preparing to nest. But according to Wheeler, Krider’s Hawks only breed in the Dakotas, parts of Montana and Wyoming, and adjacent Canadian provinces. I don’t know about you, but I can’t find southern Missouri in that description. So maybe she isn’t a Krider’s. Goodness knows there’s enough variation in Red-tail plumage that she could simply be a lighter morph without being an actual Krider’s. Maybe she is a Krider’s, breeding outside of the expected range. Or maybe she and the other bird weren’t together after all. I don’t have any clear-cut answers, but when you’re dealing with nature, there often aren’t any. I finally accepted that some time ago, but I still don’t have to like it. If the weather is decent this coming weekend, I plan to go back to see if I can relocate her. I want another chance to see if I can’t get better photos and redeem myself. I know I’d feel a lot better if I could. Hawkwatch International. 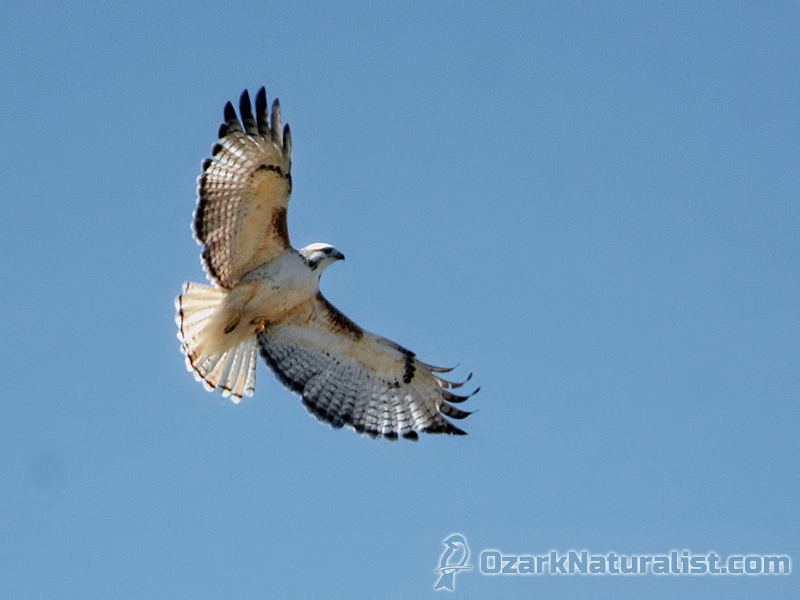 “Red-tailed Hawk.” Accessed March 6, 2018. Tallman, Dan. 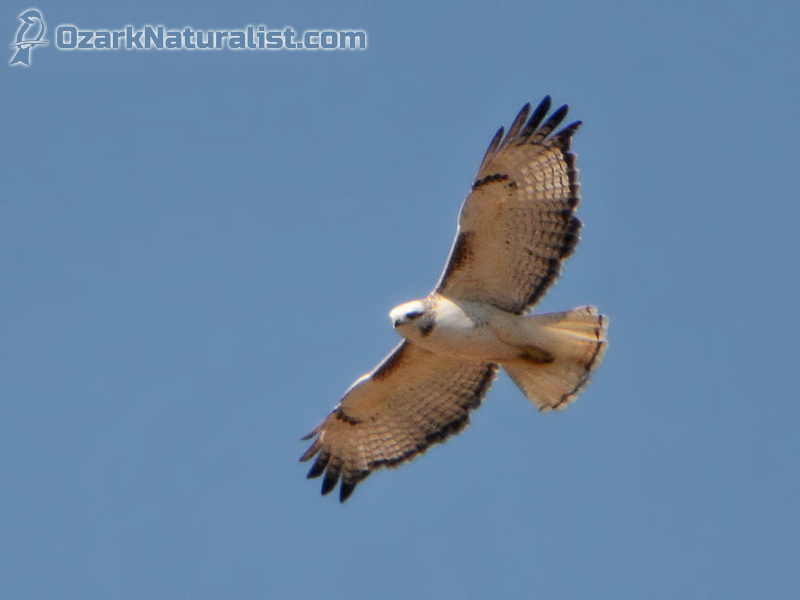 “Red-tailed Hawk Identification.” South Dakota Ornithologists’ Union. Accessed March 6, 2018. Wheeler, B. K. 2003. Raptors of Western North America.Princeton Univ. Press. Princeton, NJ U.S.A.